Heat Transfer Paper - For InkJet Printers. (For white & light color shirts). This single step commercial grade hot peel heat transfer paper can be used with any brand/model inkjet printer (ie: Epson, Canon, HP, Lexmark, Etc). Transfer time is fast, 3-7 seconds! These transfers will not peel or crack, they're extremely durable in the wash and have a soft hand. Inkjet transfer papers are not all the same. With ours you can expect the highest level of image quality, fastest transfer time and they're extremely easy to peel. 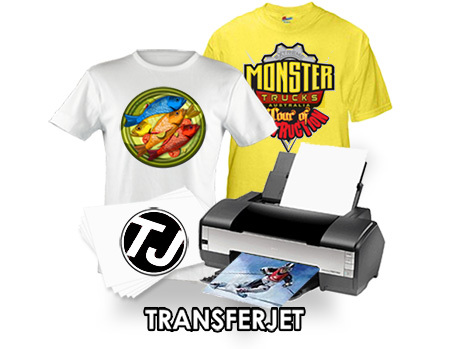 Our customers constantly tells us they have tried them all and they love this transfer paper. This transfer paper is a much higher quality than what you'll find in retail stores or online suppliers. Apply with Home Iron or Heat Press! Instructions | Transfer Cutting Tips | Inks Bleeding?